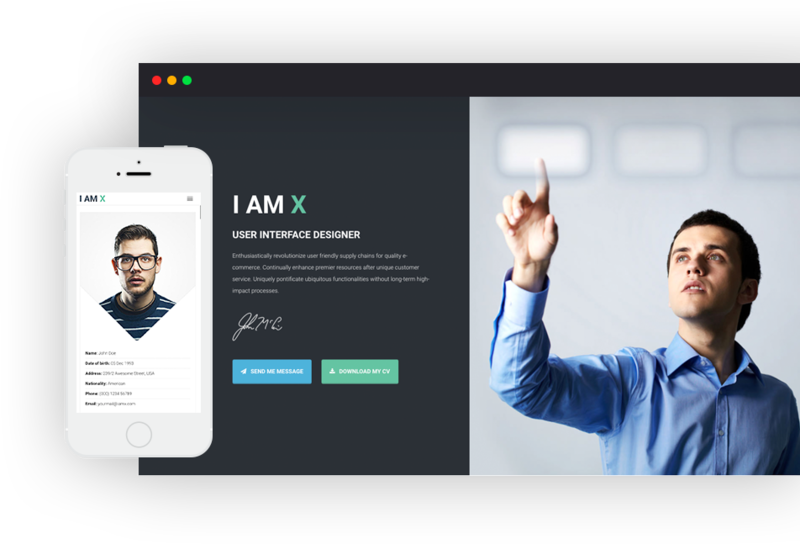 I AM X is a minimalist, modern and well-crafted responsive WordPress Resume theme for any kind of creative professionals to show their education, experience, skills, and works history in a perfect way. 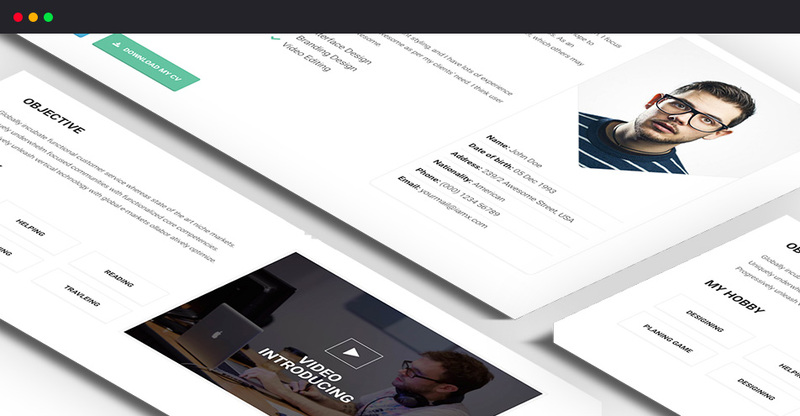 It is easily Customizable personal vCard template built with Drag & Drop Visual Composer. If you want your personal site is more noticeable among others, I AM X can be your right choice. I AM X is really easy to use, even for beginners. It comes with a very detailed documentation to help you customize it. We believe creative’s need liberty. Your personal website must be truly unique. 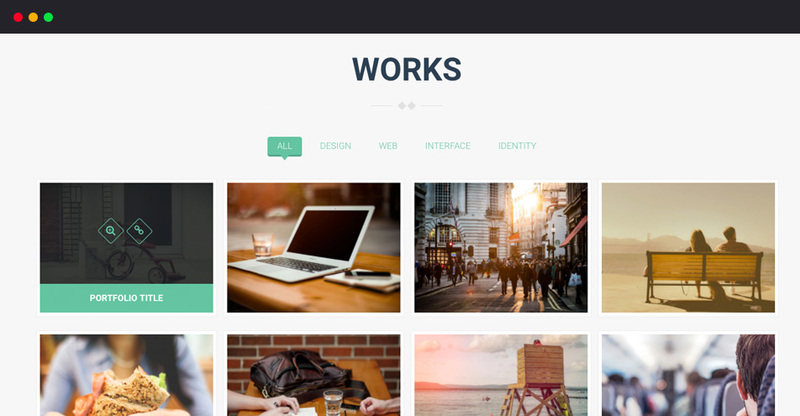 A digital portfolio reflecting who you are. Therefore, with I AM X you are never restricted by an overall template that limits your design. 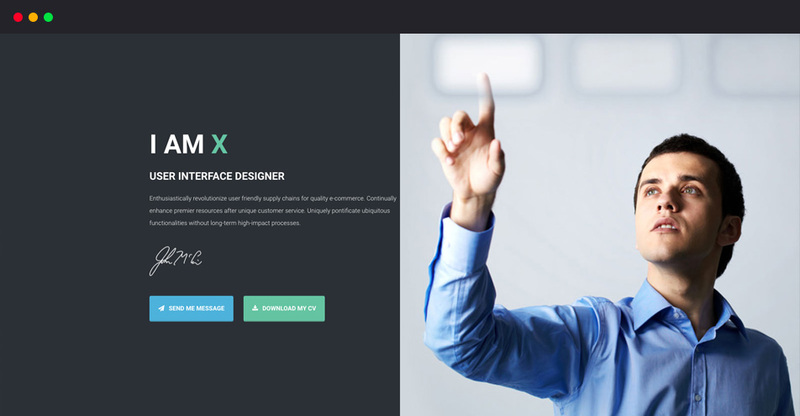 Let’s take a look at the core features of the I AM X HTML Resume Template. 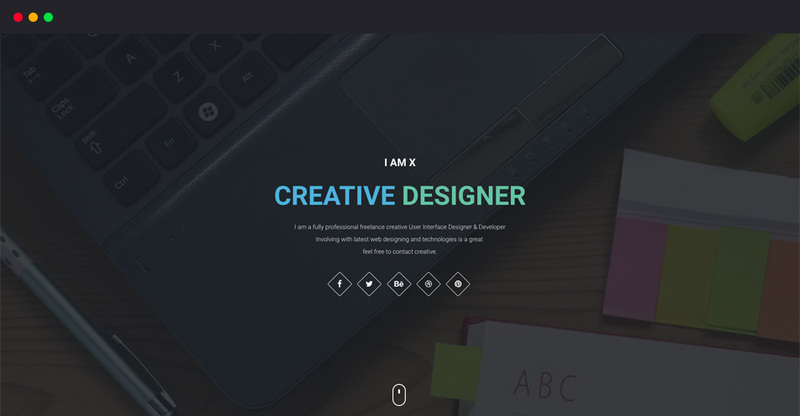 There are two template variation in I AM X WORDPRESS Resume Theme. You can also call them as ‘home variations’ while the layout is the same for a reason. A stunning big hero unit to the top dramatically increases the appeal of any website. A hero scene is a proven way to present any information with a clear and bold appearance. That’s why we’ve included 2 different beautiful hero slider in I AM X. In I AM X there is an awesome about me section where you can show your career objectives. You can show what you love to do or like to do. There is also a sub section where you can describe your expertise. There is also a short biography of you. Your visitor can know about you at a glance. About Me is the section is the first and foremost element to build a game-changing portfolio. I AM X expresses about you carefully. 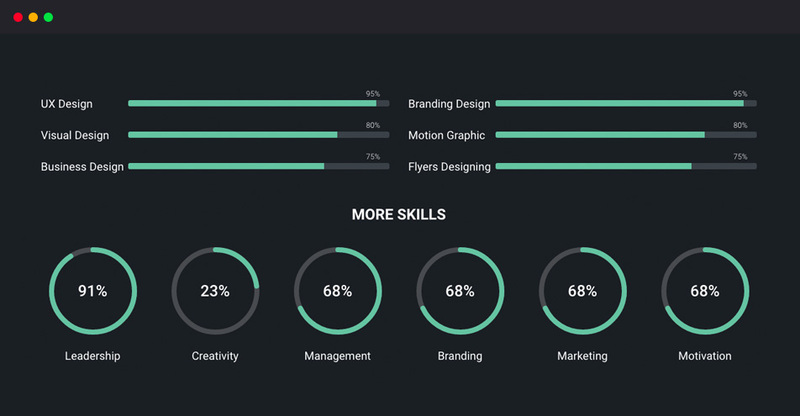 Resume Section is a very important part of a portfolio template. 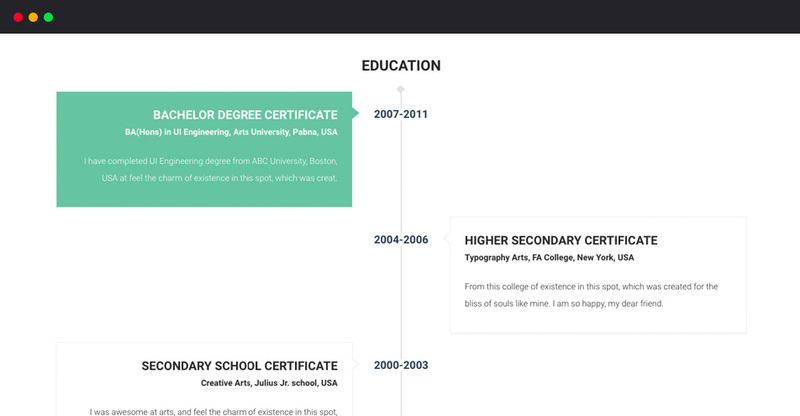 I AM X has an awesome timeline for showing your resume/academic qualification. You can show your certificate name with institute name and a little description under an academic year timeline. In I AM X there is a dedicated skills section for show your all expertise. You can use the progress bar or pie chart individually or can use theme simultaneously. The progress bars and charts are very easy to use and customize. Your portfolio plays a very important role in your quest for good freelance work or for a good job. I AM X can be effectively used to highlight your past and present projects, pieces you’re particularly proud of and that should encourage clients to hire you. I AM X can help you make your portfolio work better for you. I AM X give you a stunning blog post section. Write blog posts about your thought, about your products. Your customers will get to know you as the knowledge source for the products they want. 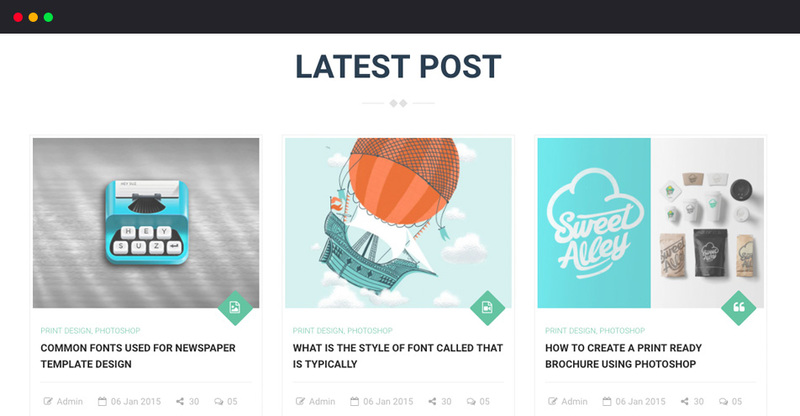 Your blog gives you the opportunity to create relevant content for your customers. Use this as a marketing tactic to drive traffic back to your website. I AM X has an awesome contact form and dynamic google map for contact with you. 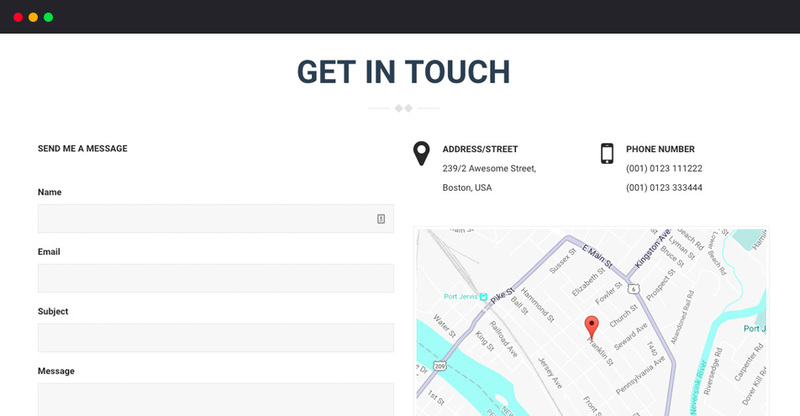 With this working contact form your clients, customers, visitors can contact with you very swiftly. And with the dynamic google location map, you can show your location visually. I AM X is fully responsive and built with the Drag & Drop Visual Composer which offers you the best possible web experience. 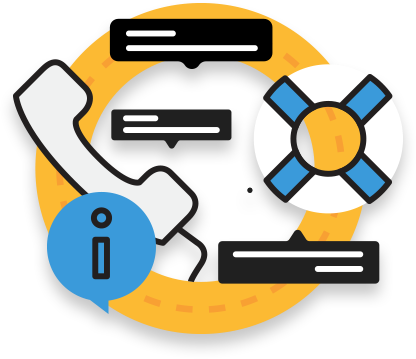 And we, the Trendy Theme team is also ready to offer our best support should you need.